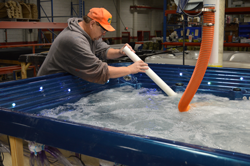 The Water Test department inspects each spa thoroughly. 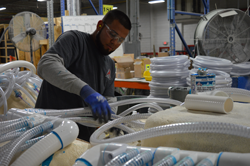 They ensure the spa does not leak, all of the spa’s components work correctly and that the spa meets all quality standards. 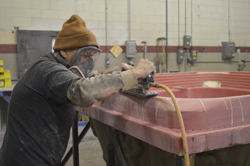 The Vacuum Forming department produces the “shell” of the spa. 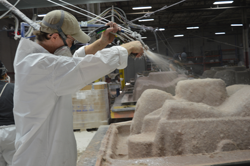 The team heats a sheet of acrylic to a specific temperature and then uses a vacuum forming oven to form the shell in a specific mold. 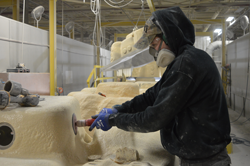 The Tooling department is responsible for the upkeep of the spa molds. 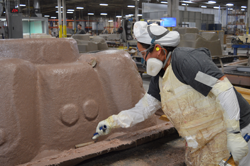 They repair any issues with the mold that keep the vacuum forming department from pulling a flawless shell as well as add or omit features to the molds. Previous tooling or auto body repair experience required. A Technical Support Representative provides support to customers, dealers and service technicians. 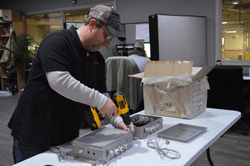 They help troubleshoot issues with the product, perform warranty work, issue replacement parts and sometimes perform repair work in the field. Previous technical support related experience required. 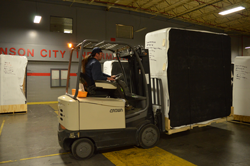 The Small Parts Shipping Clerk is responsible for picking and packing orders for shipment. The Skirting department is responsible for insulating the spa and installing the skirt of the spa. 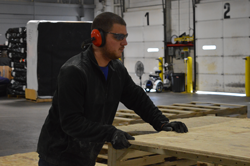 The Shipping Pallet Builder is responsible for the construction of the pallets used in shipping the spas. Previous wood working experience recommended. 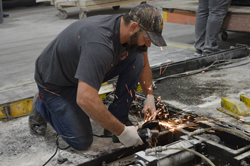 The Maintenance department is responsible for the upkeep of the facility. Their duties range from changing light bulbs to troubleshooting machinery. Previous maintenance experience required. The Jetting department is responsible for the installation of all the spa’s hardware. Each spa requires a specific number and type of jets that are positioned in specific directions based on the model. General Production positions vary. Individuals are placed according to staffing needs in each department, work history and skill set. General Office positions vary. 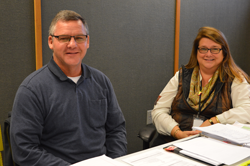 Positions may be involved in filing, data entry, providing customer service, supporting the sales team, etc. 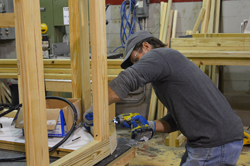 The Framing department assembles the wood frames that support the shell of the spa. Previous woodworking experience is recommended. 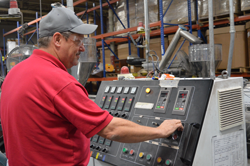 The Extrusion Mixer is responsible for mixing the color components for each batch. Mixing accuracy is key to produce the proper color of paneling. 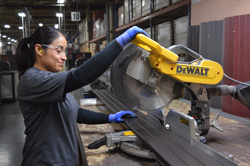 The Extrusion Cutter is responsible for cutting the paneling to size and palletizing. Panel sizes vary based on order. 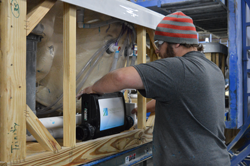 The Equipment Install department is responsible for the installation of all electrical components in the spa; packs, pumps, Bluetooth, stereos, etc. The Drilling department is responsible for trimming excess material off the shell and drilling the holes for the jets, waterfalls, filters, etc. The Detail department is the final department before shipping. 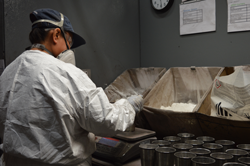 Detail is responsible for final quality checks, thoroughly cleaning the spa, packing any accessories that are to be included and wrapping the spa for shipment. 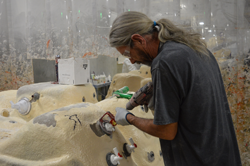 A Chop Gun Operator sprays fiberglass in a pattern onto the shell of the spa. 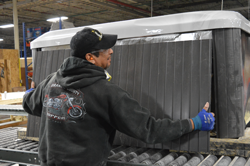 This process hardens the shell making it extremely durable. Previous chop operator or auto painting experience preferred. 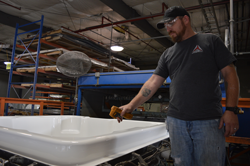 The Bath department is responsible for the production of free-standing, walk-in and jetted bath tubs. 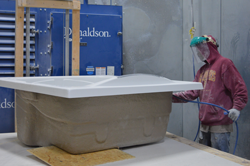 Positions vary from vacuum forming the shells of the tub to prepping tubs for shipment.